All-in-one to cleanse, exfoliate, and moisturize. Blesses face and body from nose to toes. Perfect for all skin types, including acneic skin. Seabuckthorn (Hippophae rhamnoides) Essential Oil – Seabuckthorn diminishes imbalances from the inside out. This supercritical extract is packed with omega fatty acids 3, 6, 7, and 9, antioxidants, vitamin, palmitoleic acids, carotenoids, and phytosterols. A single drop of seabuckthorn oil contains 190 different bioactive compounds. This bright orange essence is incredibly regenerative and complexion clearing – relaxing redness and paring puffiness. 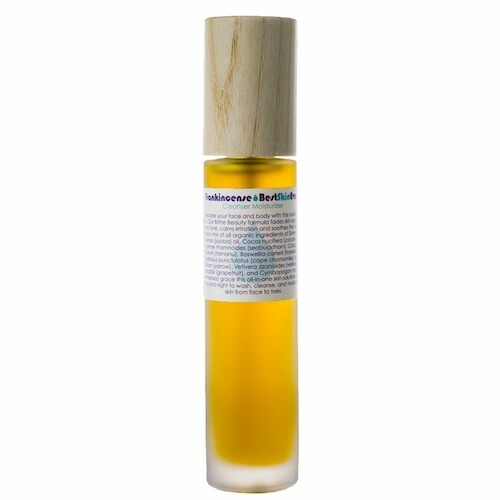 Seabuckthorn is an excellent addition to cleansers for acne. It helps to harmonize skin with the sun. Tamanu (Calophyllum inophyllum) Oil – Enchanting tamanu is a regenerative berry oil that is easily absorbed deep into the skin to keep moisture in and protect the skin from dryness. . Tamanu is said to even skin tone and reduce the appearance of scars. Even for a fatty oil, it has a high (92%!) lipid content. It is also a wonderful ingredient in moisturizers for acne-prone skin. Frankincense (Boswellia carteri) Essential Oil – Sacred frankincense is the pièce de résistance of skincare! It relaxes redness, firms the skin, and infuses every skin cell with copious moisture. Famous for reducing the appearance of scars and age spots. Yarrow (Achillea millefolium) Essential Oil – Yarrow is particularly suited to balancing skin oil production, especially in oily skin. It visible revitalizes the skin by fantastically improving the appearance of age spots, dark circles, and stretch marks. Vetiver (Vetivera zizanodes) Essential Oil – Rich, earthy vetiver oil is grounding and calming for the skin, anointing the skin as the rain anoints the grass. Vetiver is a known moisturizer that helps skin maintain its youthful plumpness while soothing tired tissues and balancing sebum production. Grapefruit (Citrus paradisi) Essential Oil – – Toning, tightening grapefruit refreshes the skin while lifting sagging tissue and smoothing the signs of aging. Palmarosa (Cymbopogon martini) Essential Oil – – Pleasant palmarosa is distilled from a tropical, fragrant grass resulting in an aromatic oil that smells like a lemony-geranium-rose and is simply splendid for the nose! This formidable skin rejuvenator is rich in mighty monoterpenols, emollient esters, loving linalool, and generous geraniols. It is packed with beneficial phytochemicals. This potent oil tones and rejuvenates the skin. It is used to support radiant skin and to achieve balance between oiliness and dryness. This BSE is excellent for sun damaged and thirsty skin!! Leaves my skin so smooth and glowie? ?I am a loyal customer of Living Libations because there has not been a single product that dissappointed me..i mean…purity and excellence in all its glory..thank you Wilma for bringing these magical blends to Europe!!!?? One of my all time Favorites!! I mix it with cell serum and my skin hasn’t looked better. The smell is addictive, i use it all over my body as well right after shower and my skin is super soft! Love it!! !